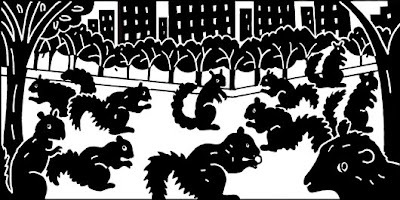 Ananka's Diary: Black Squirrels Take Over Britain? As you may know from earlier posts, there's a squirrel war raging across the Atlantic. Slowly but surely, grey squirrels have been invading every last inch of the British Isles, endangering their cuter, more colorful red squirrel cousins. But now there's been an unexpected entry into the battle. Black squirrels, the friskiest, most fearsome squirrels of all have been seizing ground from the reds AND the greys. And I'm sad to report, it may be our (America's) fault. Scientists have already traced the invasion of grey squirrels to a pair of American squirrels which were released into the wild in 1892. (Sorry about that!) But until recently, no one knew where the black squirrels (which were first spotted 90 years ago) had come from. You can read more here. I just have one question . . . There's a small population of black squirrels here in New York. (In fact, there's one that lives in the garden behind my house.) They're badly behaved, sure. But they haven't exactly kicked all the other squirrels out of town. What makes the British so sure that they're taking over the country? Just because they're Americans doesn't mean they're all bad! BREAKING NEWS: I had no idea when I wrote this post that January 21st (aside from being my mother's birthday--happy b-day, Big K!) is SQUIRREL APPRECIATION DAY!!! Am I the only male kiki strike fan? Personally, I'm partial to the color black, but the red squirrels are the cutest! If Great Britain is mad at us Americans because of SQUIRRELS then they need to loosen up and pick their battles better. Green Leaf: Not at all! You're in good company. I've found that male Kiki Strike fans are an exceptional breed. Awww, those squirrels are sooo cute!!!!!!!! I like the red and black ones the most. Squirrels's wars.That's...unusual at least.I found all of them cute anyway. We have tons of of black squirrels here in New York (I'm sure you know that, Kirsten). Since I just moved here from the midwest, I was a little freaked out when I saw five black squirrels converging in my front yard. I might've ran outside screaming like a maniac. Waving a rake. At the (black) squirrels. But to be fair, they're a little intimidating. They're all cute! I'll always have a special place in my heart for the red ones, though, because they remind me of Germany. am i the only one who likes the plain american grey squirrel? although i have to admit that the red ones are cute!! I'm partial to the grays. We used to have (before we moved) at least a dozen little grays in the back yard. One was so tame that it would sit on a tree branch at the edge of the yard while I refilled the bird feeder. Though the reds here are adorable. Oh my! The Red's tufty ears are soooooo cute! Those squirrels are so cute. They just scream "take my picture". But the red one is my favorite, followed by the black one, then the gray on. I love squirrels! My brother is in the First Lego League (it's robotics), and his team name is the "Super nutty ozone protecting squirrels". I love the name! Hehehehe. I think I know which one is Kiki's favorite . . .
Those squirrels are so cute!! I've never seen a real squirrel. I'd like to watch Rocky and Bullwinkle (one of the celebration ideas on the link). Ah, yes, but what about the Giant Malaysian Squirrels that mug people and steal important backpacks? red red red go go go red !!!! Squirrels are apparently tougher than we think-Kasper had a point! Green Leaf: Ha ha, not at all! I think guys who like Kiki Strike really are bred better. ;) Right Kirsten? I like the black ones, but they are all super cute! I think I must side with the Grey squirrel, as it is the more popular type in my area, and the type of my blood brother. When I first saw black squirrels in NYC I thought that they were just filthy grey squirrels. I was amazed to find out that they really were black.